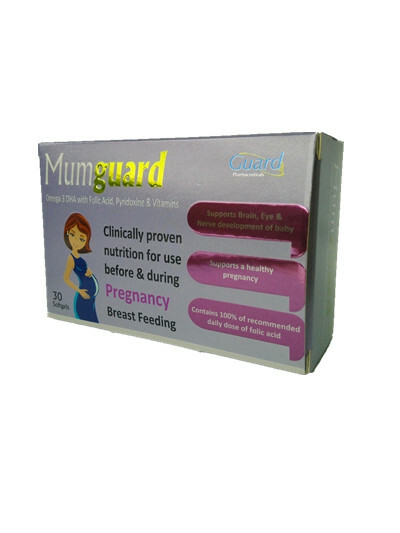 Mumguard contains Omega 3 fatty acids in the form of fish oil with DHA200mg.DHA is important for optical infant brain and eye development. DHA is important throughout pregnancy, particular in the third trimester when major brain growth occurs. Supplementation of DHA in the mother's diet improves infant developmental outcomes, such as eyehand coordination, motor skills and attetion span. Suggested use: one capsule to be taken with your main meal.. Appropriate overages of Vitamins added to compensate for loss on storage. Storage: *store below 30℃ at dry place. *protect from light. *keep out of reach of children.